I am a beginner in electronics and programming for microcontrollers, so traditionally I started from driving an LED which is a ‘Hello World!’ project in microcontrollers world. I started with STM32 controller (STM32F103) which is ARM, and I can use C language. When my LED finally started blinking, I thought it might be useful from me (and hope I can be useful for someone else) if I create a simple re-usable template project. As a result, now there is one more repository on GitHub. I use Linux, no fancy GUI, sorry. 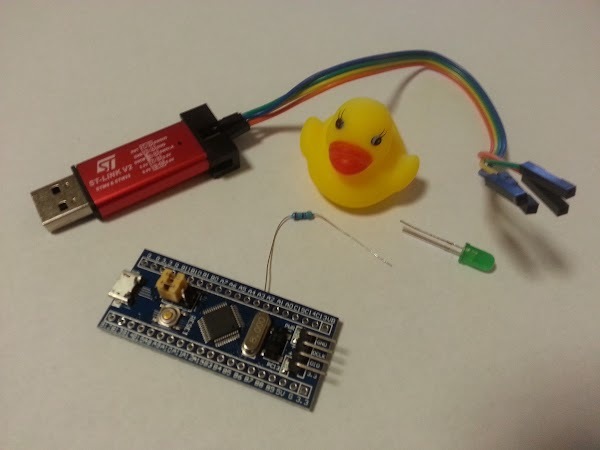 STM32 Discovery Development On Linux – this article is about STM32F4Discovery which has an ST-LINK/V2 debugger/programmer. But I had only STM32F103 board which is similar, but still a little bit different. Programming ARM Cortex (STM32) under GNU/Linux – this one is about STM32F4 as well. Probably there are articles about STM32F103 on the Internet, but I gave up googling. To be honest, it’s much easier to use some STM32 Discovery board. But it’s so big … Some of these boards even contain an LCD display which is cool but … Is there anything smaller? Luckily there is a Maple Mini project which is based on STM32 microcontroller. But I found a clone from guys in China … It was only $1.90. I was so happy, so I ordered two. Ah, no free shipping … fine, it’s $4.24 in total. Not too much I guess. This board is based on STM32F103C8T6, but it doesn’t have a built-in debugger/programmer like STM32F4Discovery. So I needed a programmer then. Guys from China saved me again. I found a clone of ST-LINK/V2 programmer. It was only $3.45. And free shipping, hooray! I also needed an LED and a resistor. The resistor may be 200 or 330 Ohms. I wrote a separate post about connecting an LED to a microcontroller, and choosing a current limiting resistor. By the way, all stuff arrived in a couple of weeks which I think is pretty fast for AliExpress. But maybe I just was lucky. 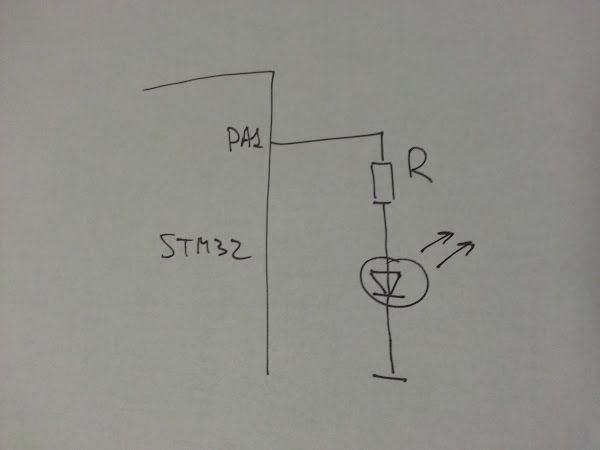 An LED should be connected to pin PA1. We have hardware, compiler, that’s all? Can we already start driving an LED? STMicroelectronics provides STM32 standard peripheral library which contains APIs to work with STM32 microcontrollers. I used version 3.5.0. The library can be downloaded here. Another option is to use STM32Cube which seems to be recommended by STMicroelectronics. I wanted to keep it simple, so it doesn’t have much stuff. main.c is the main program. First, main() function initializes pinPA1. Then, it starts an infinite loop which turns on/off the LED with a delay. 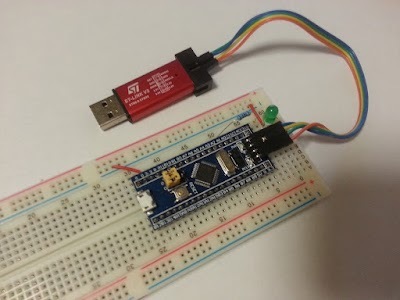 main.h is a header file which includes a couple of other header files from STM32 standard peripheral library. stm32f10x_conf.h is a header file which is used by STM32 standard peripheral library. It contains only assert_param() function which does nothing. Makefile is a makefile. Nothing surprising. “burn” runs st-flash utility which uploads binaries to a microcontroller. It requires super-user permissions. Note: the flags seems to be a bit redundant, please also see Ivan’s comment below about flags. SOURCES variable has a list of source files to be compiled. Besides of main.c, it contains a couple of files from STM32 standard peripheral library. STD_PERIPH_LIBS variable contains a path to STM32 standard peripheral library which was downloaded before. ST_FLASH variable contains a path to st-flash utility which was built earlier. 2016-07-04T23:11:35 INFO src/common.c: Flash written and verified! jolly good! That’s pretty much it. Have a next day! Это простая программа для STM32F1 микроконтроллера, которая просто мигает светодиодом, который к нему подключен. Это своего рода ‘Hello World!’ в для микроконтроллера. Собственно, пользы от мигания светодиодом нет ровно никакой, но это можно брать за основу для какого-то более сложного проекта. Я там описал, как и чем компилировать код, как и чем его загружать в микроконтроллер, какие библиотеки можно использовать, некоторые проблемы, которые могут возникнуть. И все это для Linux, для других платформ немного по-другому. Hello, good job, I’m also wanting to make my “Hello world” with a Maple Mini Clone, I had a question: Is there another way to record the mini maple without the STLink ?. Can it be done via USB? Maybe the maple has a preloaded bootloader? To be honest, I didn’t get a chance to look for other ways to flash STM32. If you mean that USB port that’s locate on the board, then I am not sure if it’s possible to use it to flash the board. I think you’ll need a programmer anyway. The programmer which I used works via USB. You can also try to use OpenOCD software for flashing, but I have not tried it. Let me know if you figure out what else can be used! Thanks! 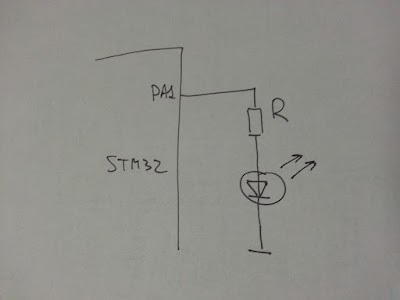 This looks like you are passing flags for STM32F4… Is right? I would be happy if you can share more info about this topic in case if find something! I updated the post with a link to your comment. Thanks for your feedback!